I have been asked about fruit snacks quite a few times and I hate it when the person is standing in front of me. (me) “I love it when parents and kids agree.” Exit, stage left. I don’t have the heart (or the balls) to tell them that they have been duped by marketing and that if their kids LOVE them – there is probably a problem. Of course, parents are confused by these snacks. Look up at this package. If you are balancing a toddler and a baby in a shopping cart – are you going to notice the word “flavored”? See how it is in lighter type? The first three ingredients are forms of sugar. Fruit snacks are made with fruit juice concentrate – a form of sugar. They can have artificial colors and flavors. The packaging of them is an ecological nightmare. Fruit snacks should be considered candy. I put little boxes of raisins in my kids lunch boxes and they love them. Though, they do complain that they aren’t getting “fruit snacks” like their friends. 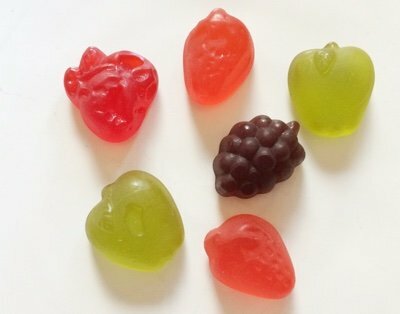 What do you think of fruit snacks? I teach kindergarten and some kids actually think fruit snacks are a fruit until I set them straight! I think some of their parents think they are fruit too! Snack Girl, we agree with this ! If it says fruit, look at the ingredient list, there the truth lies. We would love to send you our new flavors of our crunchy fruit snacks... They are just the fruit, period. For kids it's sweet yet healthy and low calorie; sweetness comes from he fruit we have selected and it intensifies since it lacks water. Hope you are interested in tasting them and reviewing them as well! I've known about this marketing scam for a long time. I've also been lucky that my daughter (5yo) didn't like anything with that sticky, chewy texture - until recently. However, from the start I've told her that it's just candy and will only be given to her as a dessert/treat. She's totally fine with that. I acutally like gummy fruit snacks, but it is only a candy, not fruit. I'm always amazed by the other parents I talk to who add them to their kids lunches as a "healthy" snack. One of my girlfriends warned me about those things a few years ago. Her daughter ate them non-stop -- and she bought them because they said "fruit" on them. Her daughter had 9 cavities, possibly attributed to the sticky sugar and //poor diet. Her dentist also said they were bad and to stay away from them. No more cavities as soon as they stopped. Good dentist! We have stayed away. Thanks for a great post. I totally agree with the above mentioned gummy fruits; however, that being said, there are some out there that are healthy. One example is Matt's Munchies. I like the Island Mango. Ingredients: Organic Mango Puree, Organic coconut flakes, organic coconut flavor concentrate, water, organic gum acacia, natural flavors and That's All!! If you are doing Weight Watchers, one package is 1 point. Seems like a good snack to me. The only problem is they are sort of pricey. I get them on Amazon.com. Bye the way, another plus is they are made in the USA!! This story brought up a funny memory for me. My sons are all adults now but when they were school-aged, I sent them to school with healthy lunches. They said they felt left out because no one at the lunch table would ever want to trade them for anything. As adults they are glad to have had the healthy lunches no one else wanted! Obvy they are not fruit, BUT some of them offer 100% vitamin C for the day, unlike Gummi bears. THANK YOU! Yes, I'm shouting that. From the rooftops. 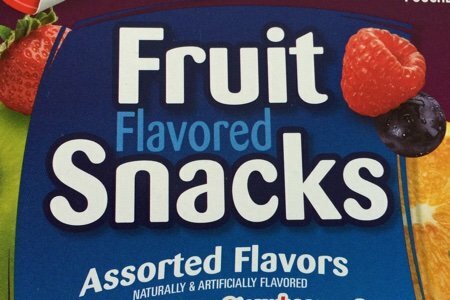 I can't believe how often "fruit" snacks are provided by schools, camps, and daycares to my children - these are organizations that parents expect to be more educated about their choices. Thank you so much for helping to reveal the truth. Easy to make other fruit snacks; make dried fruit leather. Puree any fruit you like in the blender, then pour it onto a jelly-roll pan that is sprayed with Pam, put in oven at 250, prop the door slightly open by sticking a wooden spin in the door. Let it in there until it dries. Usually overnight. If you have a food dehydrator, this is way simpler. But when it is so cold, this is a time you may not mind having the oven on very low heat. I agree that packaged fruit snacks are not nutritious. I much prefer fresh fruit, but as an on-the-go Weight Watcher, the occasional bag of fruit snacks is a convenient, portable 2-point treat. I teach PE to elementary, I always point out the ingredient Carnauba wax is also a product in Turtle Wax...used to wax and polish cars. We love the Simply Balanced snacks at Target. They are Organic and only about 3-4 bucks per box. In a pinch, they work well! We don't buy the ones/types reviewed above. Apple Puree Concentrate, Apple Juice Concentrate, Contains 2% or Less of: Natural Flavor, Strawberry Juice Concentrate, Citrus Pectin, Lemon Juice Concentrate, Vegetable Juice (Carrot, Cabbage) for Color, Citric Acid, Ascorbic Acid (Vitamin C). I agree these aren't a healthy snack, but at least most offer 100% of daily allowance of vitamin C, which you don't get from Gummi bears. The first 2 ingredients are corn syrup and sugar. Do we even need to look at the rest of the ingredients? These should be on the candy aisle. I totally agree with all of this so we act as if the fruit snacks in our house are a special treat. Everyone I know makes fun of me cause my kids call fruit snacks "treat snacks" cause that's what they are treats. A great "fruit snack" is freeze-dried fruit, which is the fruit, the whole fruit, and nothing but the fruit, with the moisture removed to make it light and crunchy. I don't let my kids have fruit snacks very often. I call fruit snacks cavities in a box just like all chewy candy. I buy the organic fruit snacks. Which it is better but, I use it as a snack with lunch. It really isn't a filler snack by itself.